Salma Gandhi is a swedish instrumental band formed 2005 in Malmö. The members had been active at the stoner/metal/punkscene in Malmö for years and was hungry to create something totally different. After hours of jam sessions and a lot of fun they started to find some kind of a sound and concept and started making compositions. The musical genre is sometimes described as 70´s filmmusic or stonerjazz and the goal of the band is to give the recipient a somewhat narrative musical trip with a gallery of strange characters and different murky landscapes popping up along the way. 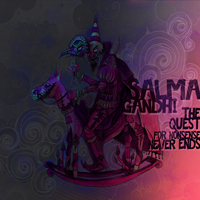 2012 they will release their debut album "The Quest For Nonsense Never Ends" at Transubstans records. Some of the main influenses are Pink Floyd, Oddjob, The Ethiopiques, Boris and Alfred Jarry.